Aroma beads can fill a room with fragrance, without the safety concerns of candles or wax warmers. Best of all, they are simple to make at home -- little muss or fuss. All it takes is the aroma beads, a jar and fragrance oil. The beads can be left clear or dyed a favorite color or to match room décor. Aroma beads are plastic beads that absorb scented oils easily. They look a lot like the filling used for plush toys, but the beads for plush toys will not absorb fragrance oil. Aroma beads, fragrance oils and liquid candle dye can be found with candle- and soap-making supplies in craft stores or online. Essential oils also work well with aroma beads. If you color the beads, make sure to use a liquid candle dye. Food coloring or soap dyes do not mix well with the fragrance oil and will rub off on anything the aroma beads touch later. Mix the beads and the fragrance oil in a jar with a lid. Glass jars are ideal, but HDPE and PET plastics work well too. Look for a 1 or 2 in the triangle on the bottom of the bottle. Water bottles, peanut butter jars and soda bottles are good examples of these plastics. 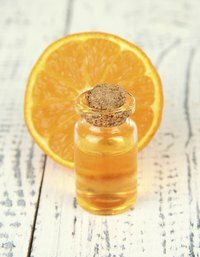 Pour the fragrance oil into the jar first, using 2 to 3 tablespoons of fragrance per pound of aroma beads. If you are dying the beads, add the dye to the fragrance oil before adding the beads. It only takes a drop or two of the dye to get good color. Once the fragrance oil and dye are mixed in the jar, add the aroma beads slowly. The fragrance oil needs to coat the beads completely. Once the beads are in the jar, place the lid on tightly and shake well. It can take over a week for the oil to absorb completely; some oils take longer than others. Temperature can also make a difference -- oil absorbs faster when it is warm than in cold weather. Be patient. Shake the jar often to ensure the oil coats the beads evenly. Don’t be afraid to get creative. While there are plenty of scents available, you can always try custom mixing fragrances. Add a little clove and cinnamon to pear or apple. Mix mint and chocolate or chocolate and cardamom. Not every combination will smell spectacular, but with practice, you can create a completely unique and pleasing fragrance. Keep the beads in a closed jar until ready to use to preserve the fragrance. Place the beads in an open jar, bowl, or in a fabric sachet when ready to use. Be careful, though. The oils will damage or stain wood or painted surfaces. Do not use them in wax or oil warmers, as they will melt. Using them in a hot car can also melt the beads. They can last several months, depending on temperature, exposure, and fragrance.